You will be given a reference e-book to read which has 153 pages And the test will be based on that e-book , you can take final test within 1 year of purchase. A teaching assistant who is also known as instructional assistant refers to paid or volunteer workers that assist teachers in their attempt to complete all their daily tasks and objectives for every class. This assistant is capable of performing numerous functions. One of these is work with small groups of children, record grades, grade assignments, cut out papers that can be used in projects and create copies of projects. Teaching assistants are also often responsible in supervising classes for a shorter period in case a teacher is required to go out of the office. Teachers often seek the help of a teaching assistant so they can easily deal with students who are in great need of attention while they are in class. They will be tasked to provide extra attention and time to these students especially if teachers find it difficult to provide time and attention to them when holding larger classes. Other duties and responsibilities performed by teaching assistants include executing scheduled duties such as preparing for classes, performing admin duties, setting up and arranging displays all throughout the school and working with individual children. They are also responsible in helping pupils or students who are in great need of extra support as a means of completing their tasks, taking care or comforting children who are upset or face an accident, telling stories to children to keep them interested, listening to children read, assisting teachers in maintaining their records and offering their assistance in various school activities, outings and sports events. 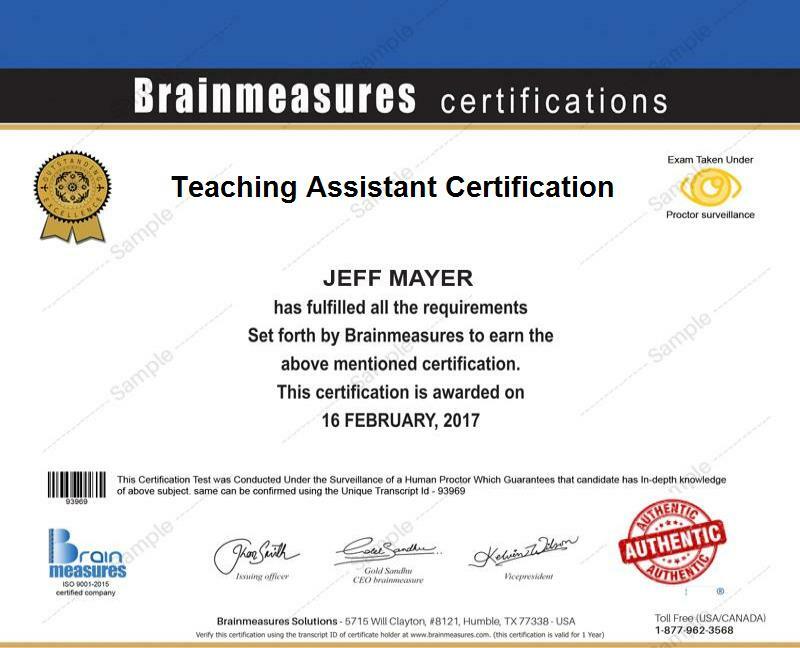 The teaching assistant certification program which you can now access at Brainmeasures is an online certification course which was developed in such a way that all aspiring teaching assistants will be able to effectively learn the basic duties and responsibilities that they will hold upon becoming a certified teaching assistant or an effective primary school teaching assistant. What make this teaching assistant course amazing are its well-detailed nature and its highly accurate contents. Enrolling in this online certification course allows you to access the companies teaching assistant training which walks you through every aspect related to working as a teaching assistant, the many skills and qualities needed to become effective in this profession and the specific roles and responsibilities that you are required to meet on a daily basis. Upon your successful completion of this teaching assistant certification course, you will be able to reward yourself with a certificate which is a huge help in increasing your chances of acquiring great positions in various educational institutions. How to effectively manage behaviour? Anyone who wishes to enjoy a more flourishing career as a teaching assistant can greatly benefit from the teaching assistant certification program which is now offered by Brainmeasures. What makes this online certification program even more remarkable is its capability to admit anyone who dreams of becoming a teaching assistant without requiring them to submit or meet difficult to comply requirements. This gives all aspiring teaching assistants an easier time reaching their goals. As mentioned above, you can easily access various industries upon your successful completion of a teaching assistant certification course. This means that you will get the chance to access jobs with more stable pay. As a teaching assistant certification holder, you can work as a certified teaching assistant which usually lets you enjoy an annual salary of $39,000 to $75,000. Note that this salary will also be dependent upon the specific level of position that you are holding.